George Andrew Reisner (b. November 5, 1867 - d. June 6, 1942) was an American archaeologist, best known for his excavations of the Pyramids of Giza and other sites of Ancient Egypt. Through his expeditions, Reisner discovered thousands of historical treasures, including the tombs of Queen Heterpheres, the mother of pharaoh Khufu (Cheops) who built the Great Pyramid of Giza. Among his numerous discoveries were papyri evidencing mathematical calculations and other data that provide insight into the significantly advanced civilization of ancient Egypt. Reisner was a methodical excavator who prided himself on the records he kept. His meticulous approach to archaeological excavations, keeping accurate records and preserving artifacts, laid a strong foundation for subsequent archaeological efforts that continued to advance human knowledge of this and other people from the past. George Andrew Reisner was born on November 5, 1867, in Indianapolis, Indiana, to George Andrew Reisner and Mary Elizabeth Mason. His father's parents were of German descent. He received his undergraduate degree from Cambridge University, graduating in the class of 1889, and went on to study at Harvard University, where he received his Masters in 1891. In 1892, he married Mary Putnam Bronson and then left for an excavation in the Middle East. He received his Ph.D. in 1893, writing his dissertation on Semitic languages. At Harvard, he received a study grant to research cuneiform at the University in Göttingen, Germany, where he studied under Egyptologist Adolf Erman (1845-1937), and later with Kurt Sethe (1869-1934) at the University of Berlin. Sethe taught Reisner hieroglyphs, supplementing his already extensive knowledge of Arabic, cuneiform, and various other ancient languages. This training would prove invaluable when Reisner excavated archaeological sites in Egypt. From 1897 to 1899, he worked in Cairo, Egypt, on the Catalogue General Project for the Egyptian Museum. After that he received funding for excavations in Egypt from Phoebe Apperson Hearst, mother of newspaper publisher William Randolph Hearst. In 1905, Reisner returned to Harvard to work as an assistant professor, a post he held until 1914. During this time, he led several important projects, including the archaeological survey of Nubia for the Egyptian government, 1907-1909, and directing the excavations of Samaria in Palestine, 1908-1910. From 1910 to 1942, Reisner was Curator of Egyptian collections at the Boston Museum of Fine Arts, and from 1914 to 1942, Reisner held the position as a Professor of Egyptology at Harvard. In addition, he explored the pyramids of Meroe and dug out the temple at Napata. Even in his old age, despite suffering from progressive blindness, Reisner worked on dictating manuscripts. His daughter, Mary B. Reisner, who had learned from him at the digs, assisted him in his final articles. Reisner died in his sleep on June 6, 1942, in Giza, Egypt, and is buried in the American cemetery in the Mari Girgis area of Cairo. Following his death, Reisner's Harvard camp was closed in 1947, and the Egyptian government awarded one half of the objects found by Reisner to the excavation sponsors—the Hearst Museum at University of California, Berkeley, and the Museum of Fine Arts in Boston. George Reisner spent many years excavating archaeological sites in Egypt. The Hearst Expedition of the University of California funded his work for five years, from 1899 to 1905. During this time period, Reisner excavated the cemeteries of Naga ed-Deir, Egypt, as well as Quft and Deir el-Ballas. At these sites, Reisner began to formulate his own scientific approach to archaeological excavations, based on the methodological systems he had learned in Berlin. He developed a number of expedition record books and put an emphasis on field photography. He recognized the need to model Giza in three dimensions. He prepared a model of the Third Pyramid to illustrate how it was built. The model remains in the Boston Museum of Science. During this time he also explored mastabas, flat-roofed, mud brick, rectangular buildings with sloping sides that marked the burial site of many eminent ancient Egyptians. Inside the mastaba, a deep chamber was dug into the ground and lined with stone or mud bricks. This was where the body would reside. When a mastaba was built for the burial of the Third Dynasty king Djoser, the architect Imhotep enlarged the basic structure to be a square, then built a similar, but smaller, mastaba-like square on top of this, and added a fourth, fifth, and sixth square structure above that. The resulting building is the Step Pyramid, the first of the many pyramidal tombs which succeeded it. As part of the Hearst expedition work, Reisner also discovered what came to be known as the "Reisner Papyri." Dating back to the eighteen hundred B.C.E. periods, they contain one of the most basic mathematical texts. The texts were later deciphered in Boston. The early publications showed that the scrolls were among the oldest Egyptian bureaucratic texts known, recording the mundane business details of construction projects, work in the royal dockyards, and agriculture in the royal fields. They showed evidence of mathematical knowledge, particularly remainder arithmetic, carefully applied to the practical situation of building projects. In his later expeditions, Reisner uncovered the fact that the Nubian kings were not buried in the pyramids but outside of them. He also found the skull of a Nubian female (whom he thought was a king), and which is now displayed in the Peabody Museum at Harvard. Reisner believed that Kerma was originally the base of an Egyptian governor and that these Egyptian rulers evolved into the independent monarchs of Kerma. He also created a list of Egyptian viceroys of Kush. He gained notoriety for finding the tomb of Queen Hetepheres, the mother of the pharaoh Khufu (Cheops in Greek), who built the Great Pyramid of Giza. 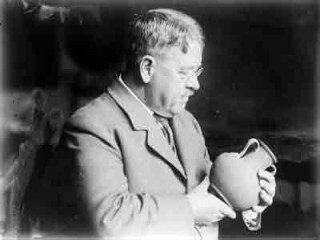 George Reisner was an experienced Egyptologist, ranked among the most important archaeologists of the twentieth century. He worked during a part of the great era of American museum-sponsored expeditions. As methods began to take on a more scientific perspective, Reisner developed a new method of documentation that proved to be more elaborate and methodical than that of the procedures developed by Sir Flinders Petrie in his Egyptian excavations. * Dunham, Dows and George Reisner. 1970. The Barkal Temples. Boston: Museum of Fine Arts. * Dunham, Dows and George Reisner. 1982. Excavations at Kerma, Part IV. Boston: Museum of Fine Arts Boston. * Reisner, George. 1924. Harvard Excavations at Samaria, 1908-1910,(Harvard Semitic Series). Cambridge: Harvard University Press. * Reisner, George. 1936. The Development of the Egyptian Tomb Down to the Accession of Cheops. Cambridge: Harvard University Press. * Reisner, George. 1942. Egyptian Conception of Immortality(1912): The Ingersoll Lecture of 1911. Kessinger Publishing. * Reisner, George. 1942. A History of the Giza Necropolis, Volume 1. Cambridge: Harvard University Press. * Reisner, George. 1955. The Tomb of Hetep-heres the Mother of Cheops: A study of Egyptian Civilization in the Old Kingdom (His: A History of the Giza Necropolis). Cambridge: Harvard University Press. * Reisner, George and Giovanni Pettinato. 1985. Tempelurkunden aus Telloh. Unione accademica nazionale. * Reisner, George and William Smith. 1955. A History of the Giza Necropolis, Volume 2: The Tomb of Hetepheres,the Mother of Cheops: A study of Egyptian Civilization in the Old Kingdom. Cambridge: Harvard University Press. View the full website biography of George Reisner.